Try, try, try. What a wonderful message of self-affirmation, coming to you directly from your urban infrastructure! You can do it–whatever it is! Just make it a little farther, a little higher. Reach for the sun; step into the light! 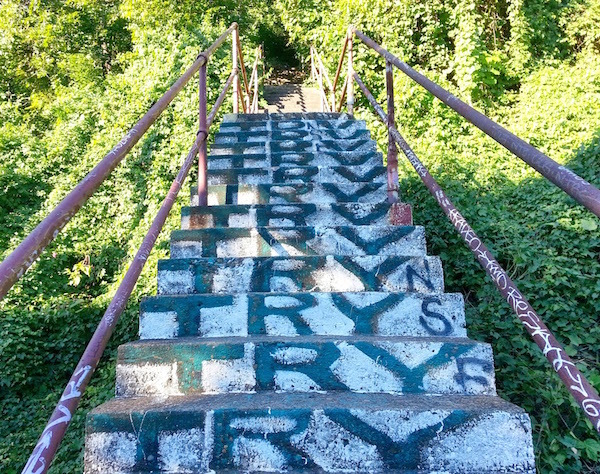 The word Try is identically painted over and over again on each of the risers on the long second flight of Bloomfield’s Ella Street steps. If only all law-scoffing paint-huffing miscreants would take such an interest in the collective conscience. 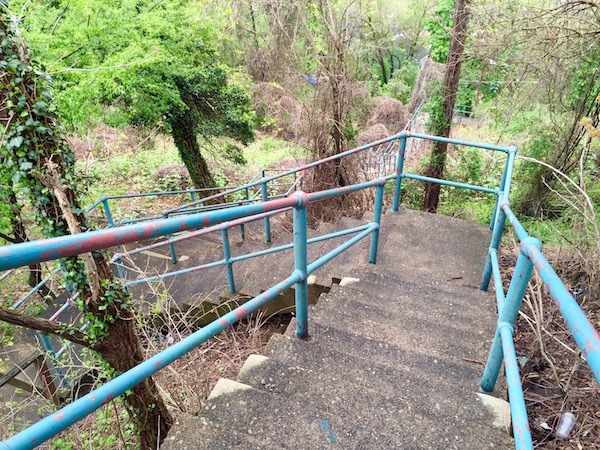 Sometimes we wish the city would put more effort into the upkeep of the steps, but if some well-meaning civil servant were to white-wash each of these, you could bank on this blogger’s mellow getting majorly harshed. 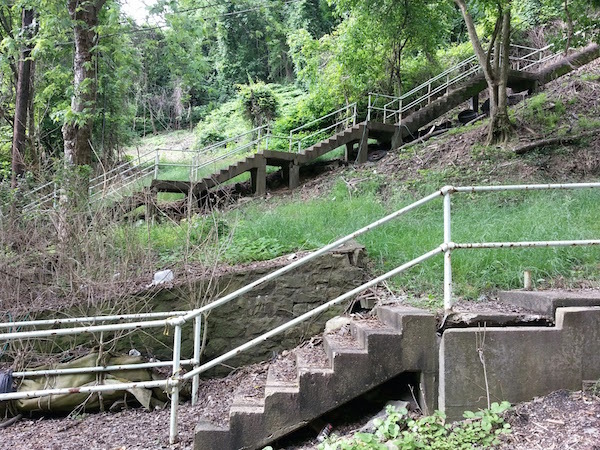 Bloomfield won’t make anyone’s short list of great city steps must-sees. 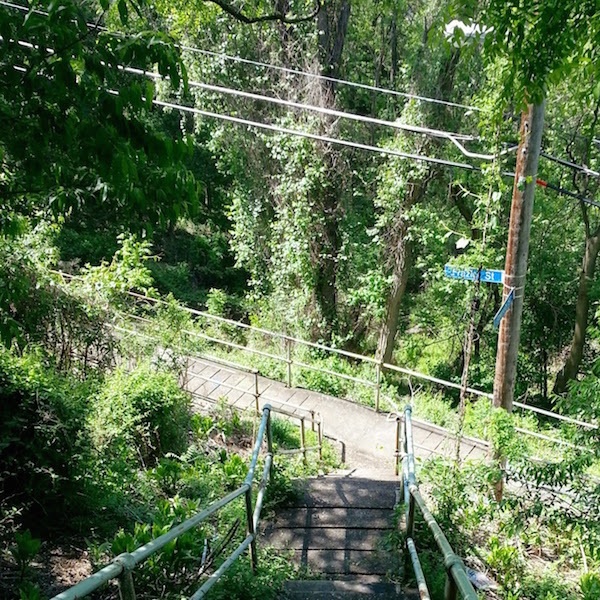 Despite the steep drop-off into “Skunk Hollow,” The Orbit knows of only two sets of steps in the whole neighborhood–these on Ella and one other at the end of Cederville. 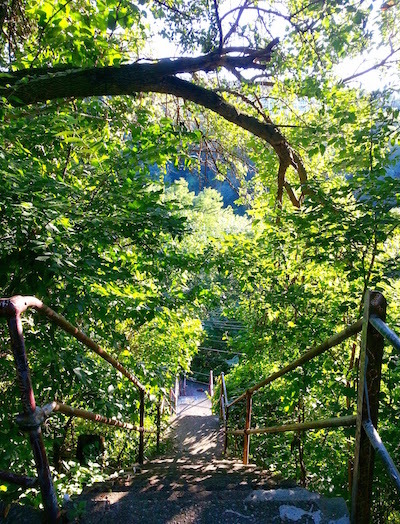 But don’t let the step snobs of more vertical wards deter you from a really great easy-access down-and-back hike. 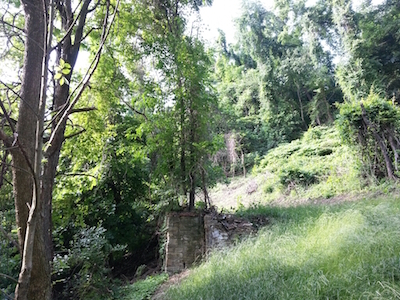 The end of Ella Street is mere blocks from Liberty Avenue, Bloomfield’s main drag, but a world away from the dense thicket of row houses you pass to get there. 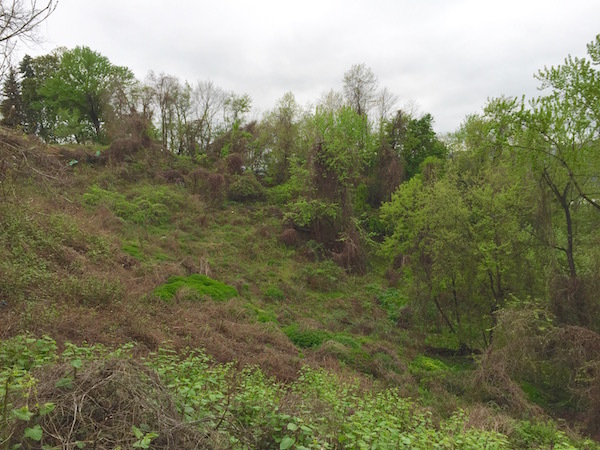 It’s all air and light and thick, untamed overgrowth, spilling off the hillside and into the hollow below (at least by this time of the year). Get your hot sausage, go for a little hike down the hill, come back up for a cannoli. 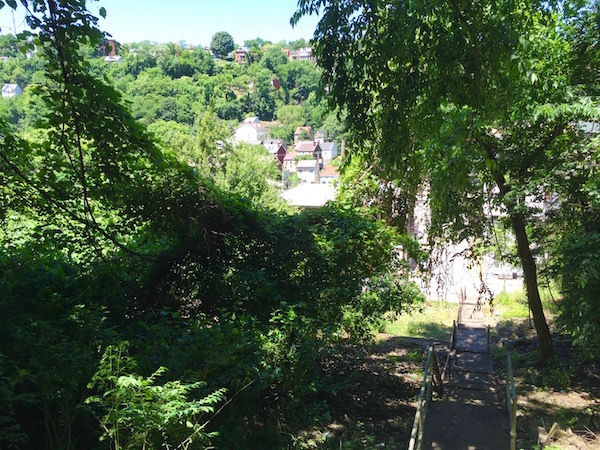 I’ve been up and down the Try Try Try steps a dozen times in as many years, and for that entire duration, there’s been a curious attachment to the bottom-most landing (just above Lorigan Street). 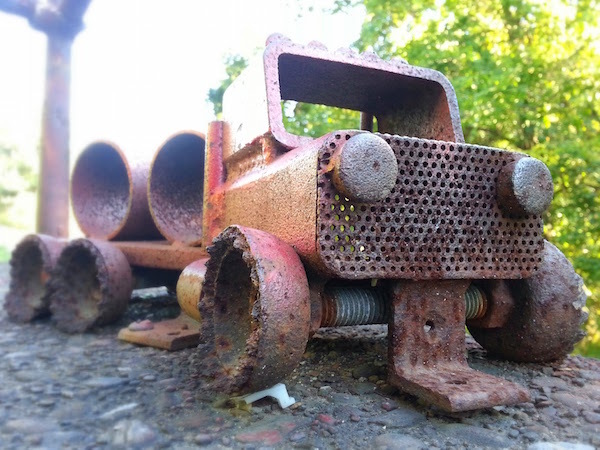 A rusted, red-painted toy truck, which seems to be a homemade piece from heavy garage scraps, is bolted to the concrete. The motivation for this is curious, as is the respect it’s paid from the crews that hang out and graffiti the step rails after hours. They may leave their malt liquor bottles, but they don’t mess with the little red truck. I tend think of it as the unofficial mascot of the Try Try Try steps: the little (fire) engine that could. 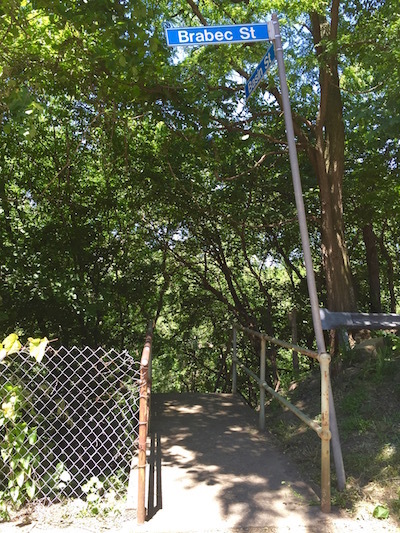 Reaching the top of the Ella Street steps (and optionally the short flight up the perpendicular Wertz Way steps that adjoin) one gets a great payoff with views through the tree canopy to Polish Hill, North Oakland, and down to Skunk Hollow. 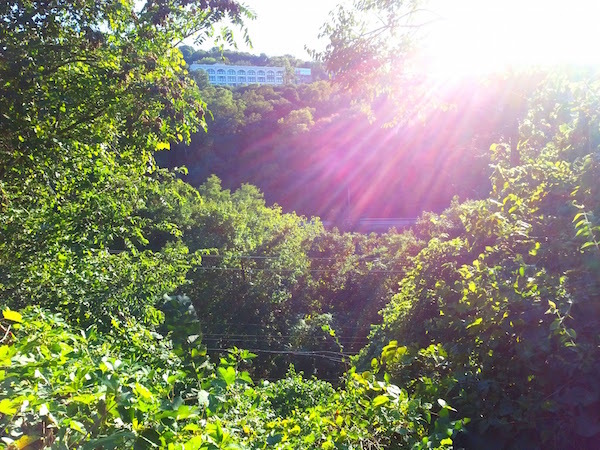 On this beautiful early fall(-feeling) day, the sky a perfect cloudless blue, the dappled light, and lush, overgrown hillsides were as spectacular as one could want. And all we had to do was try. 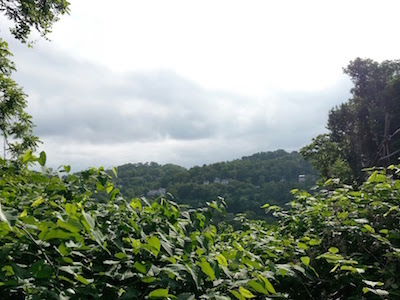 Years ago, this blogger attended a dinner party at a house on the steep hill high above upper Lawrenceville. 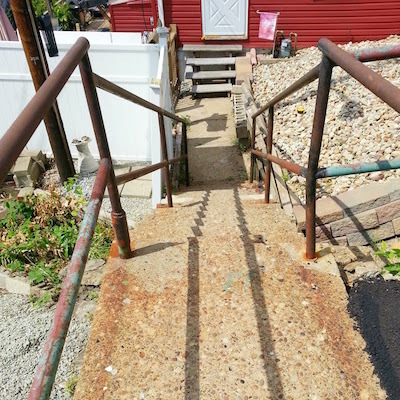 I remember very clearly that there were fifty-six exterior stairs to get from the street to the (second floor) kitchen door where people entered the house. Man, I thought to myself at the time, that’s a long way up to haul your groceries. It’s funny to think that one home’s front entrance walk (up) would be four times the length of an official city street, but that seems to be the case. 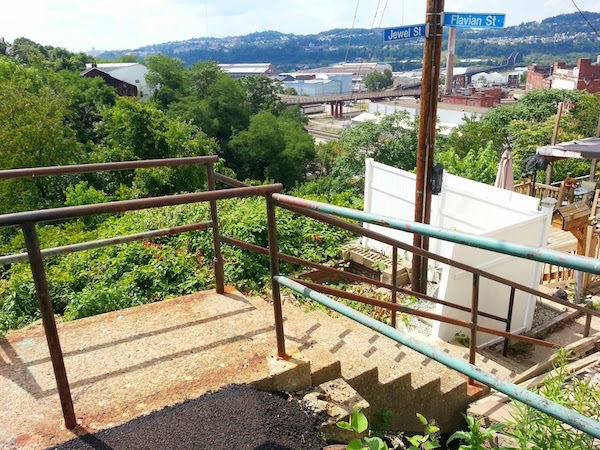 Though I don’t know it for sure, at just thirteen steps, plus one short walkway at the top, tiny Jewel Street* in Polish Hill is very likely the shortest street in Pittsburgh**. 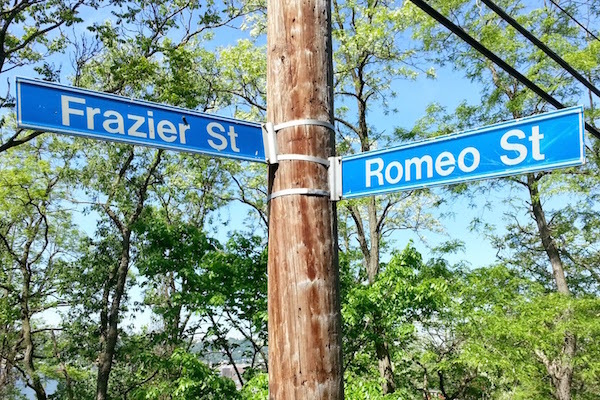 Back in May, when The Orbit reported on the remarkable intersection of Romeo & Frazier, we got all urbanophysical about what a “street” really is. Little Jewel Street seems to push that notion over the top, and then some. Let’s not worry that no vehicles are traveling on this particular thoroughfare and just consider that it has only ever served one house. 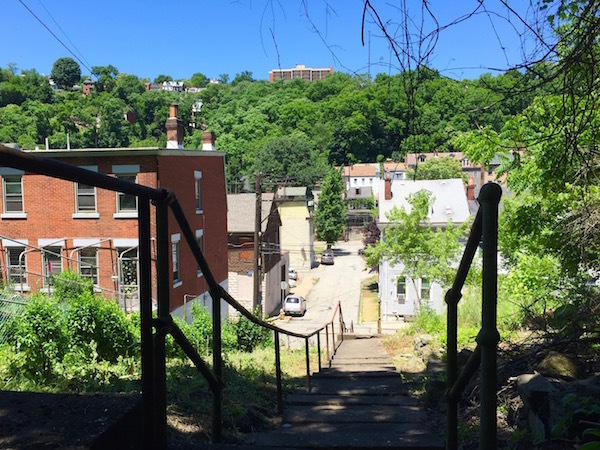 There are likely other public streets in the city that have just one address on them now, but I’d wager that most of them were built back in the day when there were rickety worker houses up and down every pointy hill and slanted dale in the ‘burgh. 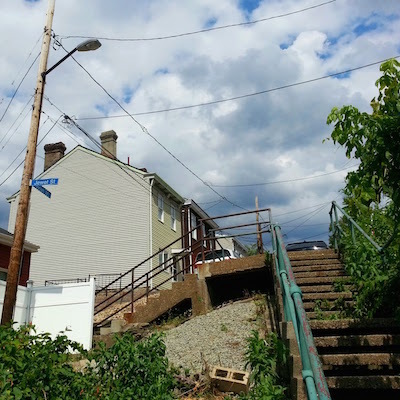 How the first residents of the only house on Little Jewel Street managed to swing the deal where they didn’t have to build or maintain their own steps is beyond both my knowledge and researching capacity. But if they hadn’t, Pittsburgh would be stuck with some anonymous half-block-long shortest street that no one would even blink an eye at. To you, Little Jewel Street, keep on keepin’ on. We’re on your side. 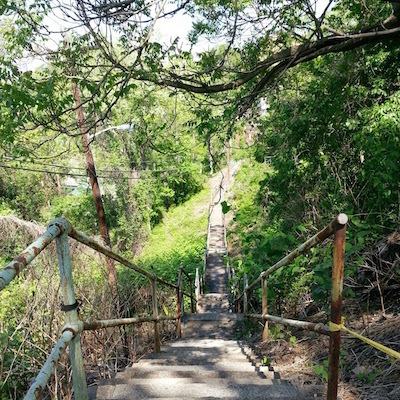 * There is a two-block-long alley across Melwood Avenue which becomes a substantial set of city steps, both marked as Jewel Street. 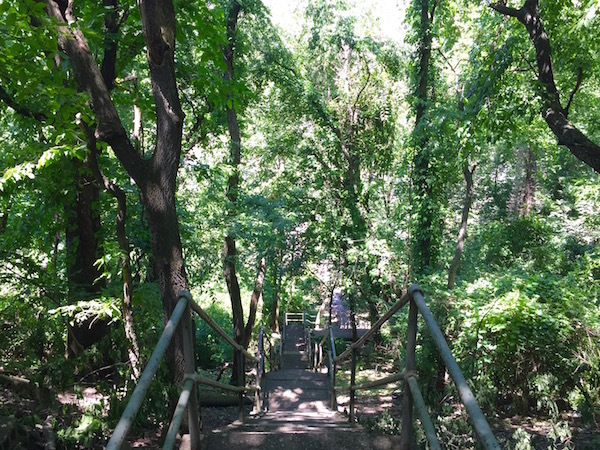 But here’s the thing: from the spot we’re talking about, you have to travel down an entirely separate street (the Flavian Street city steps) and make a hard left to get to this other Jewel. Each is an entirely separate entity. Even seemingly all-knowing Google Maps isn’t aware of this set. So we think it’s fair to count the very short residential section of Jewel off Flavian as its own street, despite the repetition in name. 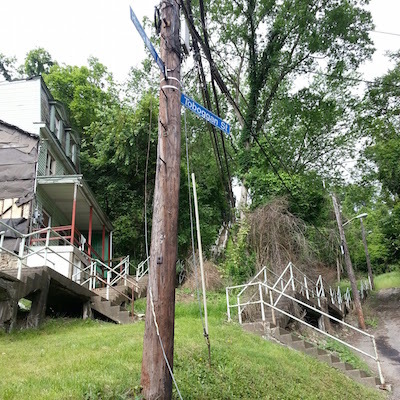 ** The Internet has very little to say about Pittsburgh’s shortest street, the main nominations being a pair of streets in the South Side–one of which no longer exists–both well over the length of Little Jewel. In our automobile-oriented culture, we tend to think of streets as a means for car travel. In cities and towns, hopefully you’ll also get a sidewalk; in the suburbs or out in the country, not so much. If you’re lucky, the road might be striped for bicycles. Pittsburgh has its own definition. 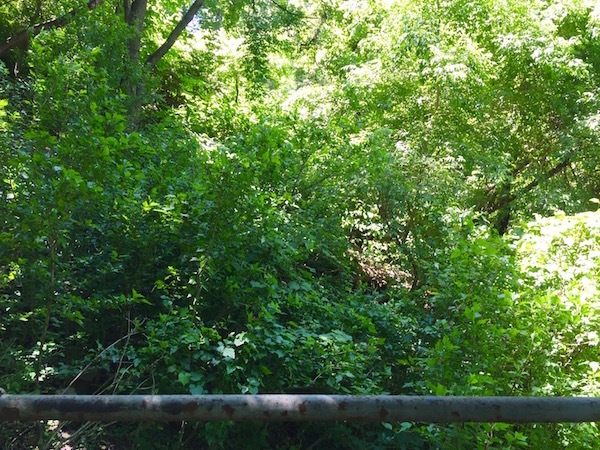 A street is simply a public thoroughfare that may be any and all of these things, but it could also just be a pedestrian walkway, usually on a hillside. 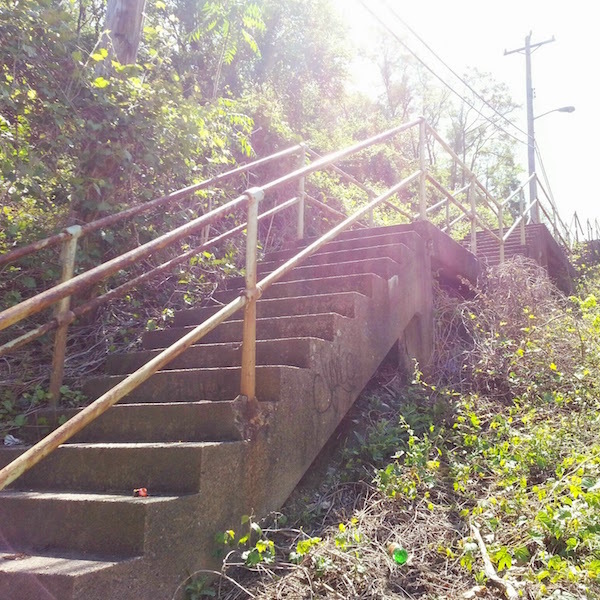 These are city steps, and we have a ton of them. Nowhere is that notion of walkways as public streets more perfect than the intersection of Romeo and Frazier Streets in South Oakland. 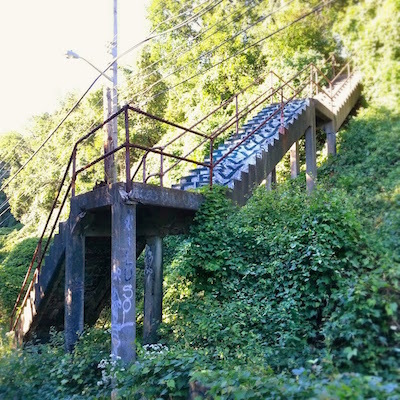 There, on a steep hillside, in a fen of trees, climbing vines, wildflowers, and thick weeds meet two terrific sets of well-maintained concrete city steps. Like any other crossroads worth its rock salt, this one comes complete with street signs and a streetlight. 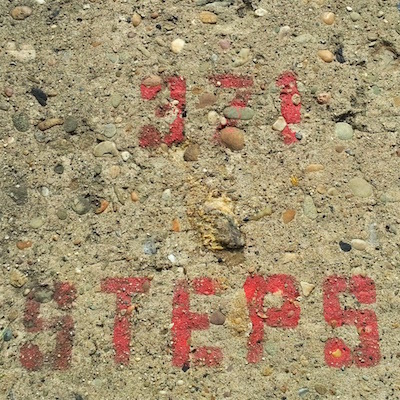 The steps go way back. Back to a time before the automobile, the bus, or the trolley. 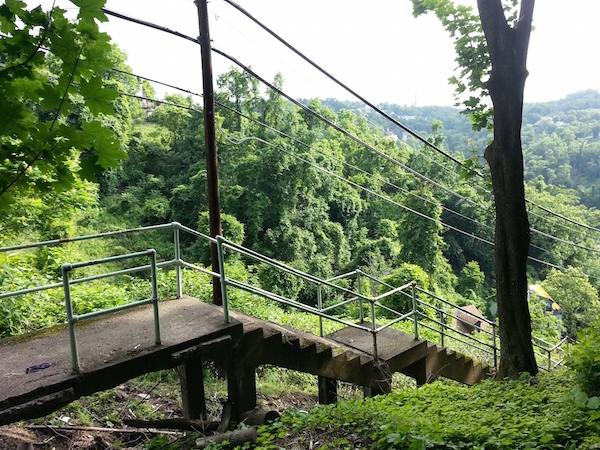 They’re sometimes considered Pittsburgh’s first public transportation system as they were used extensively by workers to commute from residential neighborhoods up the hills to the factories and business districts below. 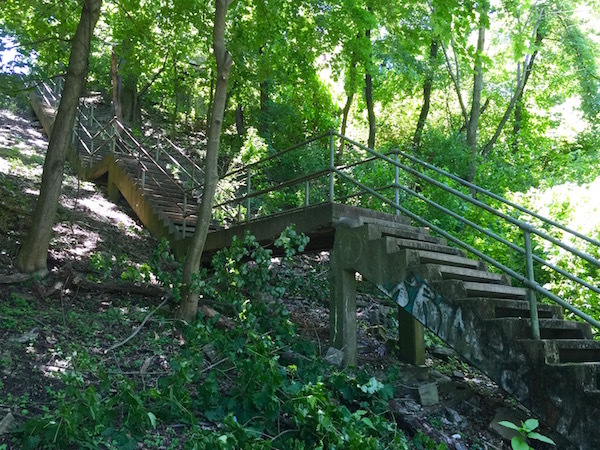 The steps don’t get anywhere near the traffic they once did. 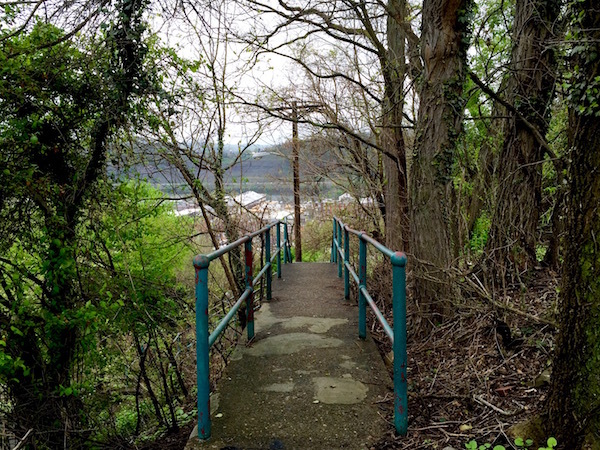 For one thing, most of those industrial areas and many of the business districts just don’t exist anymore (witness the steps leading from Troy Hill down to Route 28 or from Fineview down to 279–there’s nothing to walk down to). And then, of course, there are just a whole lot more ways to get around, and most people prefer them over the shoe leather express. 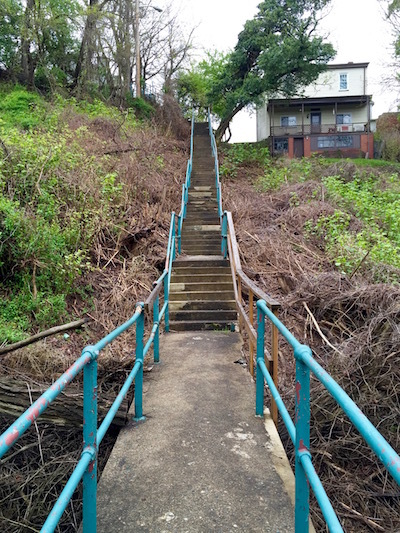 All that said, the city steps are an amazing resource. 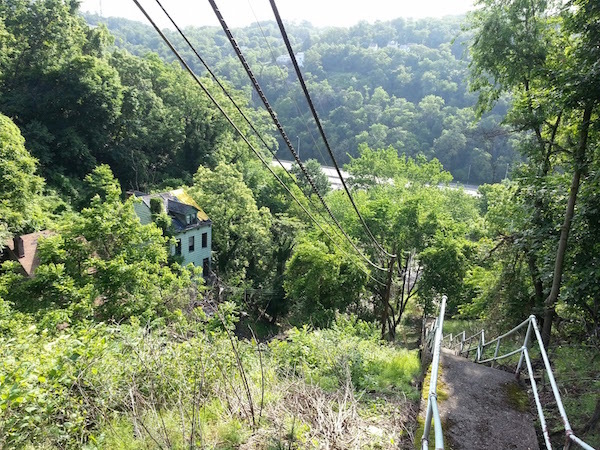 This blogger routinely drags his out-of-town visitors up to Fineview or the South Side Slopes or maybe the West End to get a full dose of up-and-down, nature-in-the-city, and a reliably terrific views from whichever ones we opt for. Some first-timers are agasp; others are just gasping for breath. Either way, you do enough of them and they’ll get you in shape right quick. Hopefully The Orbit will get back to all these spots at some point. 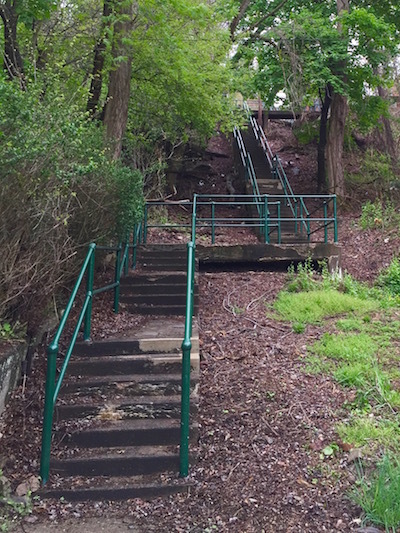 One great egg hunt of city step hikes is finding houses (or just the foundations) that are/were only accessible by the steps. On Romeo, there’s just one of these, right at the top of the steps. The house is a good 50 yards or so from the nearest paved road (also Romeo Street). It must be a pain to move into a place like this or haul your groceries in the snow, but it sure is pretty and peaceful out there. 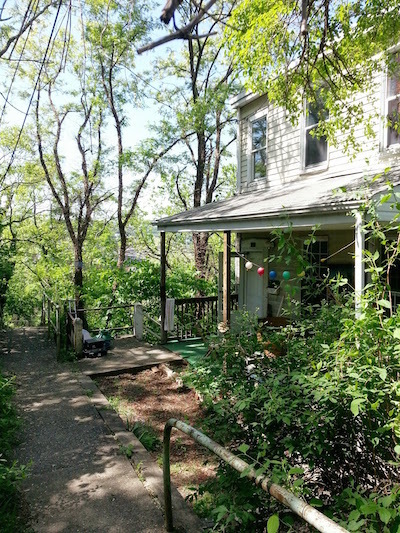 From the Tibetan prayer flags and half-inflated balloon decoration to the snare drum and Oriental carpet on the porch, I’ll admit I was making some unsubstantiated judgements about these renters skipping a little rope. But hey, man, it’s all good. They’s just on the step beat.